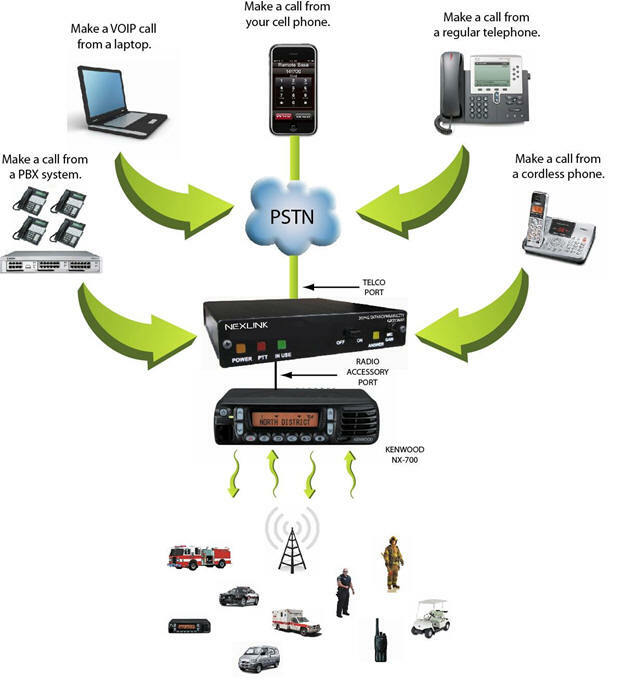 Used only on a NX-700 or NX-800 Mobile, Trunked or Conventional Systems. Can be used on a NEXEDGE conventional repeater. The NEXLINK interoperability gateway is an intelligent cross connection from cellular, PBX or PSTN networks to Kenwood NEXEDGE and analog repeater systems. It works by allowing a user to remotely access the repeater just by placing a regular telephone call to the NEXLINK gateway from any cell phone or standard phone. Within seconds the user can instantly connect to digital or analog talk groups. An interactive voice mail type system is used to allow the user to select talk groups via the DTMF pad on the users phone. The user can also enable or disable scanning to monitor multiple talk groups. Once a talk group is selected, the user presses the 9 key to start a call/transmission. To end the call the user presses the 0 key. The user can just hang up the phone to shut down the link.